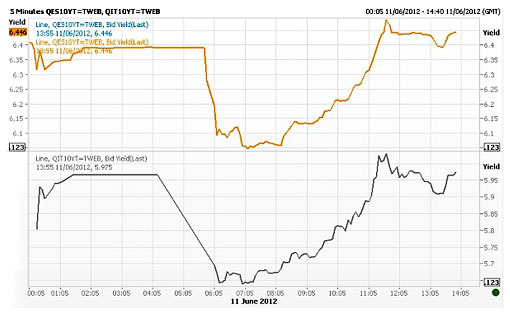 The chart below comes via Brad Plumer, and it shows bond yields in Spain (orange) and Italy (gray). As you can see, when markets opened on Monday after this weekend’s bailout of Spanish banks, yields settled down to about 6%. Hooray! But instead of a few months — or at least a few weeks — of relief before everyone got jittery again, this time we got only a few hours. By noon, yields were well above 6% in Spain and touching 6% in Italy. It’s pretty obvious that after four or five go-arounds in the eurozone crisis, financial markets just aren’t impressed with stopgap measures anymore. Not even for a short time. So much has been written about the eurozone crisis, both by me and by others much smarter than me, that it feels pointless to write about it again. The eurozone needs more fiscal consolidation, it needs more transfers from rich to poor countries, it needs to stop running persistent internal trade deficits, and it needs to abandon austerity in the short term. All of these things are politically nearly impossible, and yet, they’re the only solution aside from a crackup. The financial markets are now making it clear that they’ve figured this out and won’t be bought off with anything less.